Crunk also lauds Dunagan’s depiction of the book’s protagonists, young Ted and Poudlum, friends in 1940s Alabama despite that one is white and one is black. 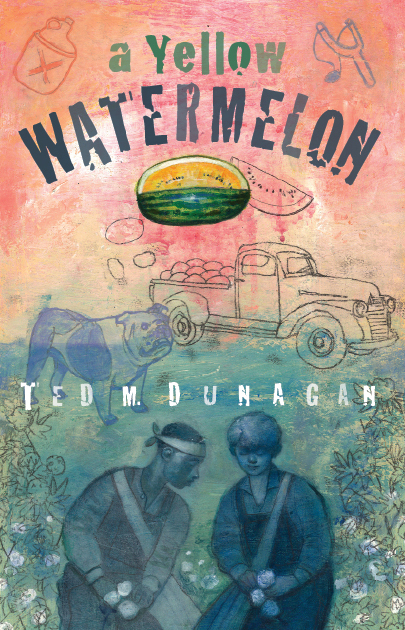 Trouble on the Tombigbee is Dunagan’s third young adult novel about Ted and Poudlum, following A Yellow Watermelon and Secret of the Satilfa. Dunagan is a two-time Georgia Author of the Year award winner for his young adult novels; the Georgia Center for the Book included A Yellow Watermelon on their inaugural list of 25 Books Every Young Georgian Should Read. Dunagan also writes features and columns for The Monticello News in Monticello, Georgia. At the end of Crunk’s review, he noted that “apart from [Tombigbee‘s] political message … the action is swift and exciting [and] the characters are complex and engaging. … The river itself becomes an immutable presence, offering both hazard and refuge, and thus serving as a near perfect setting for this coming of age tale.” You can read Tony Crunk’s full review at the First Draft website. A Yellow Watermelon, Secret of the Satilfa, and Trouble on the Tombigbee are all available in print and ebook formats direct from NewSouth Books or from your favorite bookstore. 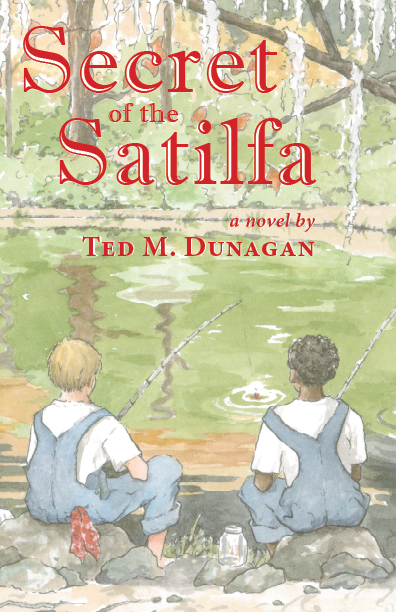 Ted M. Dunagan was honored with his second Georgia Author of the Year Award for Young Adult Fiction for his novel Secret of the Satilfa, published by NewSouth Books, in an award ceremony held June 11 at the KSU Center in Kennesaw, Georgia. Mr. Dunagan won the 2009 GAYA for his debut novel, A Yellow Watermelon; the book was also named to the inaugural 25 Books All Young Georgians Should Read list compiled by the Georgia Center for the Book. 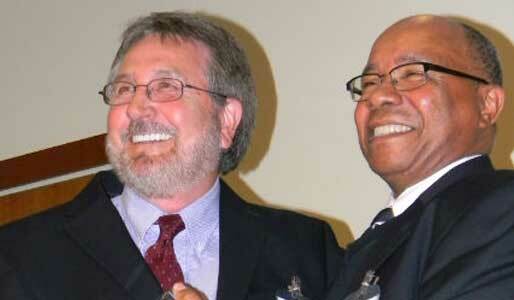 The Georgia Author of the Year Award is the oldest literary competition in the southeast. Submissions are evaluated for their narrative quality, creativity, enduring message, and ability to evoke emotion. Ted Dunagan’s books, set squarely in Southern literary tradition, chronicle the adventures of young Ted and Poudlum, friends despite the racial divide in the rural South in the late 1940s. In Secret of the Satilfa, Ted and Poudlum have their post-Thanksgiving fishing trip to the Cypress Hole on the Satilfa Creek interrupted by unwelcome visitors — fugitive bank robbers. They manage to escape and return to the creek to search — along with seemingly half the locals — for money rumored to have been hidden there by the criminals. Their escapades help them grow in character and understanding about their world and themselves. 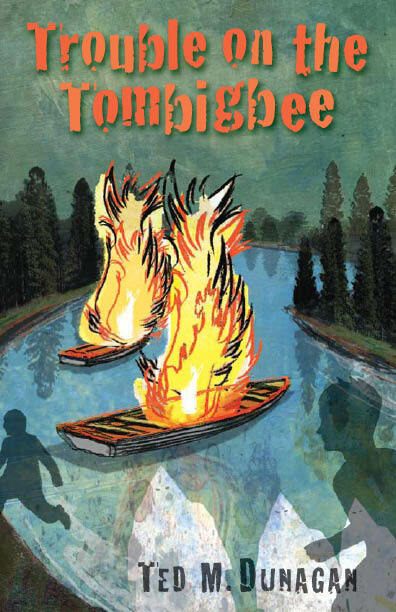 NewSouth will publish the third Ted and Poudlum adventure, Trouble on the Tombigbee, in August 2011. Secret of the Satilfa and A Yellow Watermelon are available from NewSouth Books, Amazon.com, or your favorite online or retail bookseller. Lauren Bradford, a 10-year-old student at Gulf Shores Elementary School, has won a $10,000 savings bond in the 10th annual HOAR Construction/Go Daddy.com Bowl Reading and Writing Program, thanks in part to an essay on A Yellow Watermelon by Ted Dunagan, published by NewSouth Books. The Mobile Press-Register reports that Miss Bradford submitted a book report in the initial phase of the competition on A Yellow Watermelon after the author visited her school. She won an autographed copy by asking the so-called “Secret Question.” A seasoned presenter to school children, Mr. Dunagan always includes as part of his presentation an announcement to the students that whoever asks a question he has previously sealed in an envelope will win a free autographed copy of his first book. Says Dunagan, “the secret question generates a lot of curiosity and a good bit of excitement among kids.” Winning the book in this way convinced Lisa Bradford that A Yellow Watermelon was a “lucky” book for her. For the final competition resulting in the $10,000 prize, all the students read The Pig Man by Paul Zindel. In order to reach the final stage of the competition, Miss Bradford had to compete against some 10,000 students from the state of Alabama, so her essay on A Yellow Watermelon proved lucky indeed in moving her ahead to the finalist stage. Ted Dunagan’s next book, Trouble on the Tombigbee, will be published by NewSouth Books mid-summer. A Yellow Watermelon is available from NewSouth Books, Amazon.com or your favorite retail or online bookseller. NewSouth Books is pleased to announce that Ted Dunagan’s novel A Yellow Watermelon has been named one of the 25 Books Every Young Georgian Should Read. The Georgia Center for the Book compiled this inaugural list of titles for young readers; they have produced a list of 25 Books Every Georgian Should Read since 2002. The names of the young adult titles were revealed at a private party on August 26 at the Parkers on Ponce restaurant in Decatur, Georgia. A public announcement to be followed by a book signing will take place Saturday, August 28 in Decatur’s Historic Square from 10:00 am to noon. In the best Southern literary tradition, A Yellow Watermelon explores poverty and racial segregation through the eyes of an innocent boy. In rural south Alabama in 1948, whites picked on one side of the cotton field and blacks on the other. Where the fields meet, twelve-year-old Ted meets Poudlum, a black boy his own age, who teaches him how to endure the hard work while they bond and go on to integrate the field. The white boy and the black boy encounter danger and intrigue while executing a plan to save Poudlum’s family from a corrupt businessman, and discover a great, yet simple, secret of enlightenment. A Yellow Watermelon has been compared to the works of Mark Twain and Harper Lee. 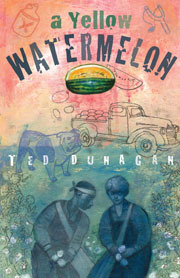 Kirkus Reviews called it “a memorable, generous-hearted tale.” Ted Dunagan was named Georgia Author of the Year in the young adult category for Yellow Watermelon. NewSouth’s Junebug Books imprint recently published the sequel, Secret of the Satilfa. 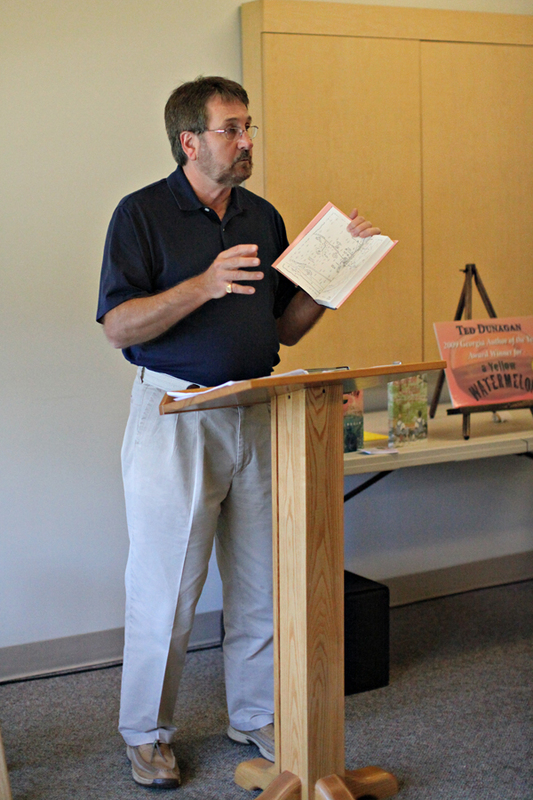 Ted Dunagan has traveled across the South speaking to book lovers of all ages about the writing process and the themes of his novels. He says his visits to Southern schools and libraries will be even more meaningful now that he knows he’s speaking about a book which has been so strongly recommended for young readers. A Yellow Watermelon and Secret of the Satilfa are available from NewSouth Books, Amazon.com or your favorite retail or online bookseller. Ted Dunagan is no stranger to fan mail. 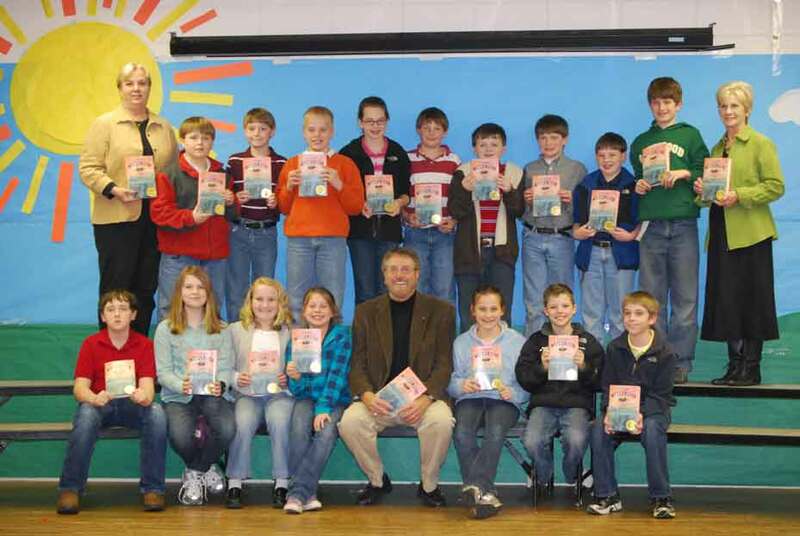 But the students of Gatewood School surprised the author of A Yellow Watermelon, winner of the 2009 Georgia Author of the Year in the young adult category, with not five or ten but a whopping 70 letters of thanks for the presentation he recently gave at the school. Ted read from his award-winning book and talked about the proces of becoming a published author. He shared stories of his own childhood in the rural South of the 1940s, episodes of which form the basis of his semi-autobiographical novels. Thank you for coming to my school. It was real fun. I was thinking of the secret question but you did not call on me. Also, thank you for giving me your signature. Now you have mine. A Yellow Watermelon is available from NewSouth Books, Amazon.com, or your favorite retail or online bookseller. You are currently browsing the archives for the Ted Dunagan category.